I picked Zack up at daycare today and his teacher said I have a funny story. She went to change his diaper and undid his onesie and out came a sunny-side-up egg and some lettuce (pretend food.) I guess he shoplifted some food from the kitchen in the drama room! Zack got a Valentine's Day card from his Great Grandma Mickey with some money in it. 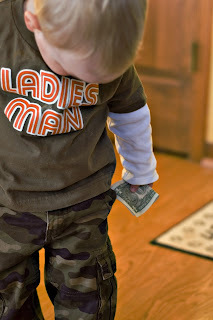 Here is the Ladies Man himself tucking a buck. How funny! Kids do the craziest things!